It is time for me to host No Croutons Required. But first, I suspect you would like to find out who won the Mushroom Challenge in April. The winner was Suganya over at Tasty Palettes. Suganya won the challenge with her Baked Portobello. If you missed the mushroom challenge, you can catch up with the roundup here. To celebrate the end of Winter, we are asking for a salad. Our theme this month is cheese, be it blue, crumbly, creamy, pongy, smoky, gooey or chewy. From vegetarian to vegan. 1. Post about your Cheese Salad. 2. Mention "No Croutons Required" in your post and link back to Tinned Tomatoes. You are free to use the "No Croutons Required" logo in your post. 3. Email me a link to your post at nocroutonsrequired@googlemail.com and include your name, the name of your blog, your location and the name of your dish, with any anecdotes. 4. Entries must be in by 20 May 2008. The roundup of entries will then be posted and readers will be able to vote for their favorite salad in the poll. The winning salad will be announced at the end of the month and the winner will receive this super duper badge to display on their blog. I was all excited as I have a cheesy soup I want to do and then I saw it was a salad! Hmm will have to think about it - and try not to forget to serve the cheese altogether like I did tonight - but I can see that sugyana's mushrooms were great inspiration! Hi Johanna, cheesy soup, I am intrigued! 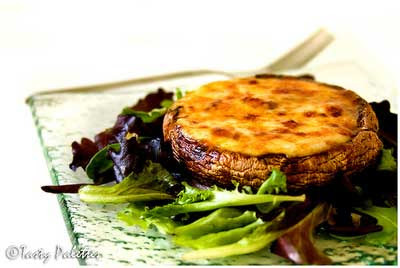 Yes, you are right, Sugyana's mushrooms could easily be served up for this month's challenge! I wait with baited breath Ricki. Go to it girl! Yum, that port mush looks super delish! I will make a salad recipe this weekend and submit, sounds like a lot of fun. Hmmm...a cheese salad. Should cheese be one of the main ingredients, or can it play a supporting role? wow cheesy salad! yum! I actually posted about a favourite cheesy salad recipe a little while ago, but I'm guessing you are calling for new posts for this event? If so, no worry - i shall just have to get thinking about a new one! Hi Frances, yes new posts. You could always look at adapting the one you loved, if it is a good one! Perfect timing Holler as it is getting to be the salad time of year! I think I have mine all picked out! It is good you grow your own Deb! I look forward to your entry, bet it will be good! Hi Kevin, That Pixie and her Marmite, tsk! You don't like that vile stuff too, do you? You deserved it Suganya, really you do! Mmmmm, lovely mushrooms, I might have to buy some tomorrow! sounds interesting as cheese can be added to any salad:) will try to think of something! Hi Mansi, I hope you enter your challenge. I will go have a look at your challenge, I haven't joined that one before! A food blogging event focused on CHEESE! I blog from Wisconsin - America's Dairyland so this is one event I'll have to participate in. Thanks for hosting it. Hi,visiting ur blog for the first time....u have a wonderful blog and the idea of adding Cheese to a salad is gr8! !Would love to see u on my blog..